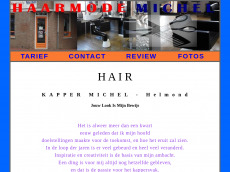 twitter:title Michel de allround kapper! twitter:description Verander jouw uiterlijk en verander dan jouw leven! Test up to 1.000 webpages of kappermichel.nl with our free plan! This page contains 882 words. That's ok. The average number of words per sentence of 17.91 words is good. The usage of strong and bold tags is perfect. We recommend the use of up to 18 tags for this page. This website redirects to "https://www.kappermichel.nl/"
The file size of the HTML document is fine (20 kB). This website only has backlinks from 18 referring domains. This website only has 74 backlinks. This website only has few backlinks from 15 different ip addresses.